Crosstab Queries, Query Parameters, Find Duplicates, Unmatched, Query Properties, Top X Records, SQL Primer, More. 80 Minutes. This is the fourth (and final) course in our mini series on Advanced Query Development. This class focuses on additional topics for making your Queries powerful. We'll begin by looking at Crosstab Queries which allow you to create spreadsheet-like views (almost like Pivot Tables) in your database. This allows you to, say, take a whole list of sales and summarize them by month and by state. Oh, and have you ever used the Query Parameters window to declare your parameters? Didn't think so. I'll show you what it is... and why you sometimes need to use it. 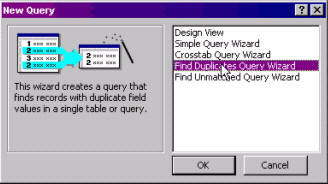 Next, we'll learn how to use the Find Duplicates and Find Unmatched query wizards. The first will allow us to find duplicated records (like all records where the company name is the same). The second will allow us to find customers without contacts (unmatched records in a related table). This is really cool if you want to send a letter to any customers, for example, who have no orders! 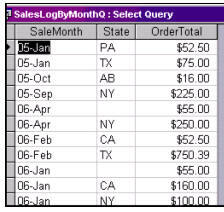 Next we'll learn about some Query Properties, such as how to see the Top X Values of your query results (maybe you only want to see the top 10 performing sales reps - instead of all 500). We'll also learn a lot of the other properties, like Unique Values, Unique Records, Column Headers, Output All Fields, etc. This statement (above) just gives you a listing of all of your company names from the customer table. SQL is really easy to learn - and it's powerful. If you know how to use it... there are a lot of places in your Access database where it's handy to know SQL. Again - it's just one more thing to make your databases shine. That's not the end of class, however. I've got a lot of little tips and tricks that I've also thrown in at the end of this one (stuff that didn't fit in any other Query class). If you like queries, you'll love this class. What is a Crosstab Query?